And he challenged his critics to tell him specifically—and accurately—what was wrong with the Pacific trade deal, not to explain what was wrong with a quarter-century old NAFTA. Where’s the nonprofit angle in this? It is the relationship of the president to ostensibly independent nonprofits. Organizing for Action is the 501(c)(4) successor to Organizing for America, which was part of the Obama election campaign. Its website URL is none too subtle: barackobama.com. On the website, OFA’s seven issue priorities do not include free trade, and even within the description of the issue most likely to reference trade, “economic opportunity,” the word “trade” doesn’t appear. Writing for the New Republic, Danny Vinik suggests that the actual impact of the Trans- Pacific Partnership is, at this moment, unclear—probably not as big and good as the free-traders suggest, but not as big and bad as TPP opponents fear. 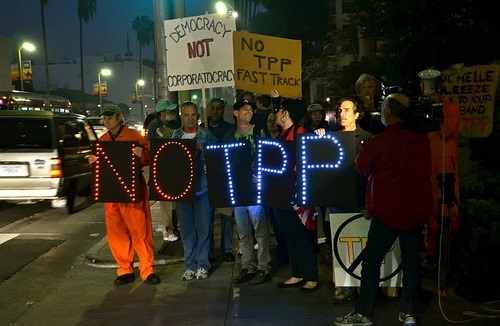 What’s really at stake is beyond the specifics of the TPP. It’s a question of the trustworthiness of government and the transparency of the government’s relationships with the big corporate interests that increasingly dominate government, regardless of the political parties occupying the White House and Congress. The president’s rallying of OFA to line up behind the TPP and fast-track trade authority contains echoes of the formation of the previously unknown Progressive Coalition for American Jobs, the ostensibly progressive coalition that has endorsed the president’s trade position. OFA’s presumed independence from the president is pretty thin, its openness about whether it has a specific position on trade is hard to determine, and its connection to the formation of PCAJ palpable (notably through the involvement of Mitch Stewart, who was in 2013 announced as the first director of Organizing for Action). As the president looks to OFA to rally to his TPP position, which seems a signpost for the president’s increased isolation from other political progressives on the issue of this trade deal, it weakens OFA’s ability to be credible in the independence of its community organizing around its core issues of climate change, immigration reform, expanding equality, preventing gun violence, health care, women’s issues, and economic opportunity. Two hundred or more executive orders are rumored to be waiting in some form of discussion or draft at the White House. Trump is believed to have opted for a “rolling thunder” approach to them, issuing fewer executive orders each day over a 30-day period.